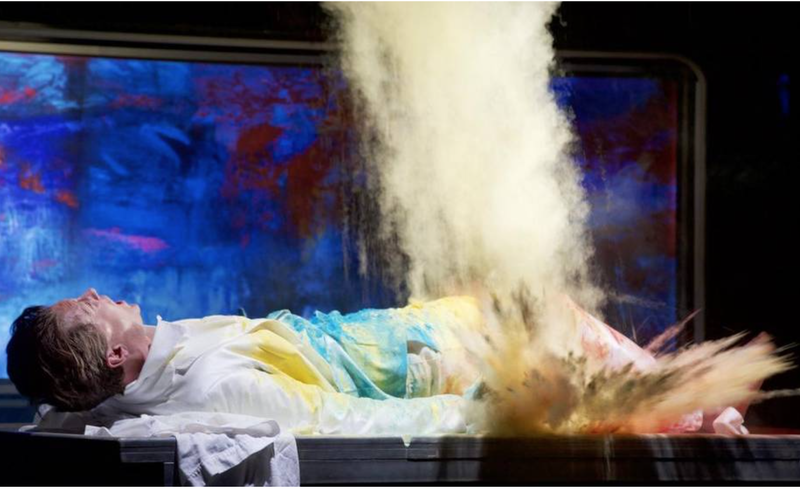 Back in 2014, we posted about barihunk Christopher Burchett performing in composer Jeff Myers and librettist Quincy Long's Buried Alive at the Fargo Moorhead Opera. He's reprising the role, in which he appears in various states of undress, at the Fort Worth Opera Festival, which is currently underway. Buried Alive was written specifically for Burchett, and he has been with the project since the first workshops with the American Lyric Theater in 2010. As part of the Poe Project, the goal was to create an opera that Poe himself might have written, although it's based on the author's The Premature Burial. The opera is directed by Lawrence Edelson, who heads up the American Lyric Theater. The Fort Worth Opera is presenting Buried Alive at the Scott Theatre at the Fort Worth Community Arts Center, which is a more intimate space than Bass Hall where they perform their standard repertory pieces. It's part of a double-header with Embedded, based on The Cask of Amontillado, and previewed at Fort Worth Opera's Frontiers showcase for new works in 2013. The stagings include twelve TV monitors with special effects and a large eyeball that ogles the crowd. Burchett also appears as the Producer in Embedded. Buried Alive tells the story of Victor, a painter whose nightmares of death begin to become real. Alternating realities are juxtaposed and culminate in a final gruesome ending. Embedded revolves around an aging American news anchor who finds herself on the wrong side of the headlines. Desperate to prove her value while being pushed out of her job by a young rival, she is tricked by a notorious terrorist into traveling to see him for an exclusive interview. The opera takes an unexpected twist and ends with a moment of triumph in face of death. There are five remaining performances on April 26, 29 and 30, and May 3 and 7. Tickets and additional cast information are available online.